Objectives Several studies have investigated the prognostic value of soluble triggering receptor expressed on myeloid cells-1 (sTREM-1) in patients with infection. However, the result was controversial. Thus, the purpose of the present meta-analysis was to determine the prognostic value of the sTREM-1 level in predicting mortality at the initial stage of infection. Methods The literature was searched in the PubMed, EMBASE, Web of Knowledge and Cochrane databases. A 2×2 contingency table was constructed on the basis of mortality and sTREM-1 levels in patients with infection. 2 authors independently judged study eligibility and extracted data. The prognostic value of sTREM-1 in predicting mortality was determined using a bivariate meta-analysis model. Q-test and I2 index were used to test heterogeneity. Results 9 studies were selected from 803 studies. An elevated sTREM-1 level was associated with a higher risk of death in infection, with pooled risk ratio (RR) was 2.54 (95% CI 1.77 to 3.65) using a random-effects model (I2=53.8%). With the bivariate random-effects regression model, the pooled sensitivity and specificity of sTREM-1 to predict mortality in infection were 0.75 (95% CI 0.61 to 0.86) and 0.66 (95% CI 0.54 to 0.75), respectively. The diagnostic OR was 6 (95% CI 3 to 10). The overall area under the summary receiver operator characteristic (SROC) curve was 0.76 (95% CI 0.72 to 0.79). When we calculated the sepsis subgroup, the pooled RR was 2.98 (95% CI 2.19 to 4.40). The pooled sensitivity and specificity were 0.74 (95% CI 0.58 to 0.85) and 0.72 (95% CI 0.62 to 0.80), respectively. The overall area under the SROC curve was 0.78 (95% CI 0.74 to 0.81). Conclusions Elevated sTREM-1 concentrations had a moderate prognostic significance in assessing the mortality of infection in adult patients. However, sTREM-1 alone is insufficient to predict mortality as a biomarker. This is the first systematic review and meta-analysis of the role of soluble triggering receptor expressed on myeloid cells-1 (sTREM-1) in predicting prognosis of infection. sTREM-1 had a moderate diagnostic significance in assessing mortality of infection in adult patients. sTREM-1 alone is insufficient to predict mortality as a biomarker, while a panel of biomarkers including sTREM-1 is recommended to predict prognosis of an infection. The major limitation was a relatively small number of studies included in this meta-analysis, which may not fully evaluate the prognostic potential of sTREM-1. Sepsis is the most common cause of death in critically ill patients.1 ,2 With the ageing of the global population, growth of invasive monitoring and treatment, emergence of the drug resistance problem of antibiotic abuse, and increasing usage of immunosuppressants, sepsis morbidity and mortality continuously increased year by year.3–5 Pathogenesis of sepsis is extremely complicated, which leads to greater difficulty in the treatment and prognosis of sepsis. Even with the most advanced treatment and monitoring equipment, the sepsis mortality rate, which has exceeded the acute myocardial infarction, remains high and the mortality increased to 30–50%, or even as high as 80–90% when septic shock and multiple organ failure occurred.2 ,6 It will be accompanied by huge treatment costs in the course of treatment for individuals, families and society.7 Therefore, early screening of high-risk groups for early diagnosis, assessment and treatment of sepsis is very important. However, there is yet a lack of indicators to assess prognosis of the patients with infection or sepsis. Bouchon et al8 reported that triggering receptor expressed on myeloid cells-1 (TREM-1) is an inflammatory immunoglobulin superfamily member, which is expressed in neutrophils, monocytes and macrophages. They also first reported that TREM-1 triggered and expanded the inflammatory response, which promoted production of inflammatory mediators, inhibited expression of anti-inflammatory mediators, and activated and amplified inflammatory cascade.9 Soluble TREM-1 (sTREM-1) is a subtype of secreted TREM-1. A large number of studies have shown that sTREM-1 could be released into the blood or body fluids during infection, and thus it could be used to identify infection and determine the severity of inflammation.10 ,11 Recently, several systematic reviews and meta-analyses demonstrated the diagnostic value of plasma, bronchoalveolar lavage fluid or pleural fluid sTREM-1 for infection.12–16 However, the prognostic value of sTREM-1 for sepsis remains to be defined, although studies have suggested the prognostic value of sTREM-1 in patients with sepsis.17–22 In this regard, a prospective study23 found that sTREM-1 altered when fluid resuscitation was applied in patients with sepsis, and that sTREM-1 was the only inflammatory marker associated with mortality. In contrast, Jeong and colleagues reported that the serum sTREM-1 level was not significantly different between survivors and non-survivors in the early stages of sepsis.24 Owing to the controversy among the previous studies, the aim of this meta-analysis was to evaluate all available publications that assessed accuracy of sTREM-1 in early prognosis of mortality in adult patients with sepsis. We systematically searched studies using PubMed, EMBASE, Web of Knowledge and the Cochrane Library. Search terms were as follows: (‘triggering receptor expressed on myeloid cells-1’ or ‘soluble triggering receptor expressed on myeloid cells-1’ or TREM-1 or sTREM-1) and (infection or sepsis or septicemia or septicaemia or septic). An example of search details using PubMed was shown in online supplementary file 1. No public date or language restrictions were applied for searching. We then further reviewed the references of selected articles to obtain potentially relevant articles. The date for the research strategies was 1 July 2015. Studies that reported a prognostic value of sTREM-1 for short-term or long-term mortality in adult patients (>18 years old) with bacterial infection were eligible for this systematic review. Furthermore, a 2×2 contingency table was constructed on the basis of results. Bacterial infection was either confirmed by microbiological test or diagnosed by clinical manifestation. Diagnosis of sepsis met the criteria of the American College of Chest Physicians/Society of Critical Care Medicine.25 ,26 The most recently published article or the most informative article was selected in case of duplicated articles using the same data from the same author group. Reviews, letters, commentaries, correspondence, case reports, conference abstracts, expert opinions, editorials and animal experiments were excluded. Articles involving paediatric patients were excluded. Two investigators (LS and DL) independently performed a search and selection of articles. Any disagreement was resolved by a third opinion (WC and YL). The following descriptive data were extracted from original studies: name of the first author, publication year, country of origin, study design, clinical setting, outcome, assay manufacturer, sample size, gender, age, patient population, follow-up period, mortality, cut-off points to predict mortality, true positive (TP), false positive (FP), false negative (FN), true negative (TN), sensitivity (SEN) and specificity (SPE) of the data. We contacted the corresponding author(s) if the data were not presented or needed clarification. Referring to the original Quality Assessment of Diagnostic Accuracy Studies (QUADAS) checklist for diagnostic studies,27 we revised some items to make the criteria more useful in our meta-analysis. We particularly evaluated (1) information bias: whether the spectrum of included patients was representative of the patients who would receive a test of sTREM-1 in practice or not; whether blood sampling was conducted within 24h after diagnosis of infection or not; whether criteria of infection was clearly described or not; (2) selection bias: if the study included consecutive patients; if withdrawals from the study were explained; (3) confusion bias: if the blind method was adopted (the professionals who influenced patients' prognosis were blinded to the sTREM-1 level). Statistical analyses were performed by the MIDAS module for STATA software, V.12.0 (Stata Corporation, College Station, Texas, USA) and Meta-Disc for Windows. A p value <0.05 was considered statistically significant. We tabulated TP, FP, TN and FN on sTREM-1 levels and mortality in infection. Relative risk (RR) was used to assess the predictive value of sTREM-1, which was pooled by fixed-effect or random-effect models based on the DerSimonian and Laird's method.28 Q-test and I2 index were calculated to assess interstudy heterogeneity.29 ,30 Values of 25%, 50% and 75% for the I2 test were considered to represent low, medium and high heterogeneity, respectively.31 If I2 was <50%, the fixed-effect model was chosen. Otherwise, the random-effect model was used. A threshold effect on the prognostic accuracy of sTREM-1 in infection was evaluated by the Spearman correlation coefficient between the logits of SEN and SPE. If no threshold effect existed, the bivariate random-effects regression model was used to calculate pooled SEN, SPE, diagnostic OR (DOR), positive likelihood ratio (PLR) and negative likelihood ratio (NLR), respectively.27 ,32 We also constructed the summary receiver operator characteristic (SROC) curve by plotting individual and summary points of SEN and SPE to assess overall diagnostic accuracy.33 Publication bias was tested by Deek's funnel plot. Univariate metaregression analysis and sensitivity analysis were performed to explore sources of potential heterogeneity in SEN and SPE. We also performed subgroup analysis restricted to patients with sepsis. A total of 803 articles were retrieved. Of them, 739 were eliminated for various reasons based on the title and abstract, leaving 64 studies scrutinised for a full-text review. Nine studies fulfilled our eligibility criteria and were finally included (figure 1). We did not identify any more relevant articles in the bibliographies of original articles. All studies sampled the blood within 24 h of admission to the hospital. Eight17 ,20 ,34 ,35 ,37–40 studies clearly described the criteria of infection. Two studies36 ,39 detected consecutive sTREM-1 concentration at multiple time points. None of the studies mentioned the blinding of professionals who might influence prognosis by the sTREM-1 level. Deek's Funnel plot showed that no publication bias existed (p=0.19; see online supplementary file 2). Huang et al40 analysed 6-month mortality of patients with tuberculosis, while other investigators analysed 30 days mortality. Thus, Hung's paper was excluded when the data were synthesised. All included studies showed that an elevated sTREM-1 level was associated with a higher risk of death in infection, with risk ratio (RR) ranging from 1.42 to 10.40. Owing to the substantial heterogeneity between studies (I2=53.8%), a random-effects model was used to pool RR estimates. The pooled RR was 2.54 (95% CI 1.77 to 3.65; figure 2). Forest plot of soluble triggering receptor expressed on myeloid cells-1 concentration to predict mortality in infection. The overall pooled RR was 2.54 (95% CI 1.77 to 3.65). RR, risk ratio. No significant difference in threshold effect was observed (Spearman correlation coefficient=0.671; p=0.069). Thus, the bivariate random-effects regression model was used to perform the diagnostic test accuracy meta-analysis and to evaluate the overall SEN and SPE of sTREM-1 in predicting mortality of infection. The pooled SEN and SPE were 0.75 (95% CI 0.61 to 0.86) and 0.66 (95% CI 0.54 to 0.75), respectively (see online supplementary file 3). The PLR and NLR were 2.2 (95% CI 1.7 to 2.8) and 0.38 (95% CI 0.25 to 0.58), respectively. The DOR was 6 (95% CI 3 to 10). 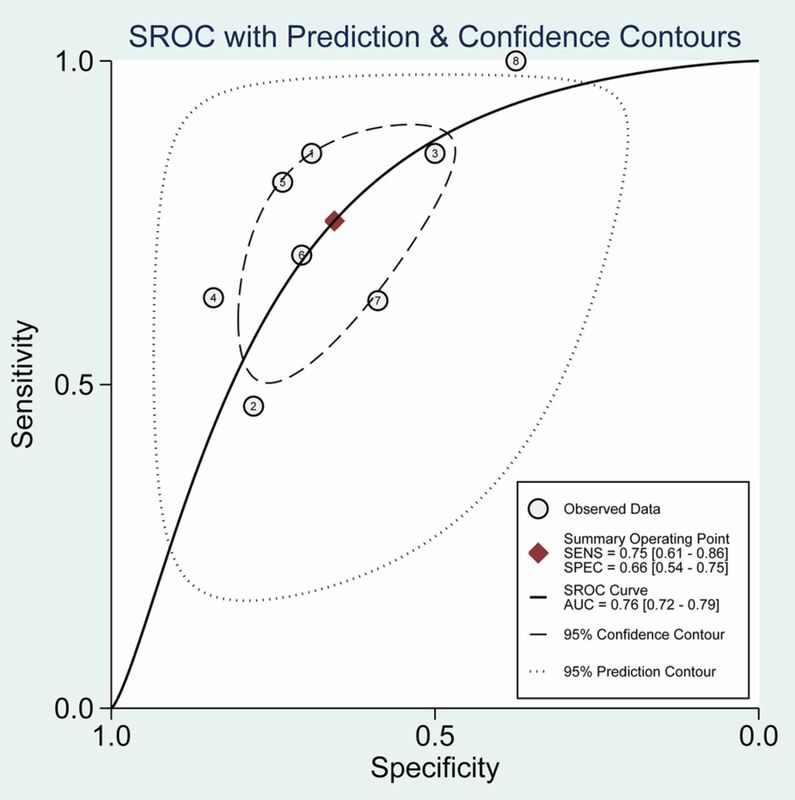 The overall area under the SROC curve was 0.76 (95% CI 0.72 to 0.79; figure 3), indicating a moderate diagnostic accuracy. SROC graph of the included studies for all patients with an infection. The overall AUC was 0.76 (95% CI 0.72 to 0.79). AUC, area under the SROC curve; SENS, sensitivity; SPEC, specificity; SROC, Summary receiver operating characteristic. A univariate metaregression analysis was performed to explore the sources of potential heterogeneity between studies. The year of publication, sample size, mortality, clinical setting and source of sample were included in the analysis. None of these factors contributed significantly to heterogeneity (see online supplementary file 4). A sensitivity analysis for included studies was performed (see online supplementary file 5). It was found that Chen et al39 accounted for the most heterogeneous. When this study was excluded, the I2 was 0.0%. The pooled RR was 3.10 (95% CI 2.30 to 4.17). The pooled SEN and SPE were 0.79 (95% CI 0.62 to 0.89) and 0.66 (95% CI 0.54 to 0.77), respectively. The overall area under the SROC curve was 0.78 (95% CI 0.74 to 0.81). When the subgroup of sepsis only was analysed, heterogeneity of the studies was acceptable (I2=9.4%), and thus a fixed-effects model was used. The pooled RR was 2.98 (95% CI 2.19 to 4.40; figure 4). The pooled SEN and SPE were 0.74 (95% CI 0.58 to 0.85) and 0.72 (95% CI 0.62 to 0.80), respectively. The overall area under the SROC curve was 0.78 (95% CI 0.74 to 0.81; figure 5). Forest plot of soluble triggering receptor expressed on myeloid cells-1 concentration to predict mortality in sepsis. The overall pooled RR was 2.98 (95% CI 2.19 to 4.40). RR, risk ratio. SROC graph of the included studies for patients with sepsis. The overall AUC was 0.78 (95% CI 0.74 to 0.81). The pooled SENS and SPEC were 0.74 (95% CI 0.58 to 0.85) and 0.72 (95% CI 0.62 to 0.80), respectively. 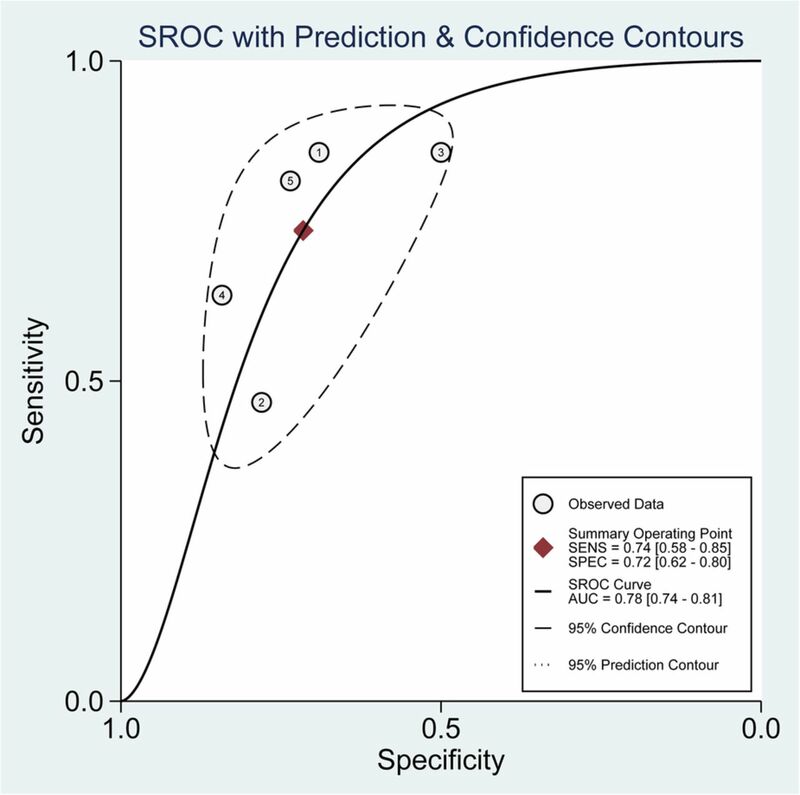 AUC, area under the SROC curve; SENS, sensitivity; SPEC, specificity; SROC, Summary receiver operating characteristic. 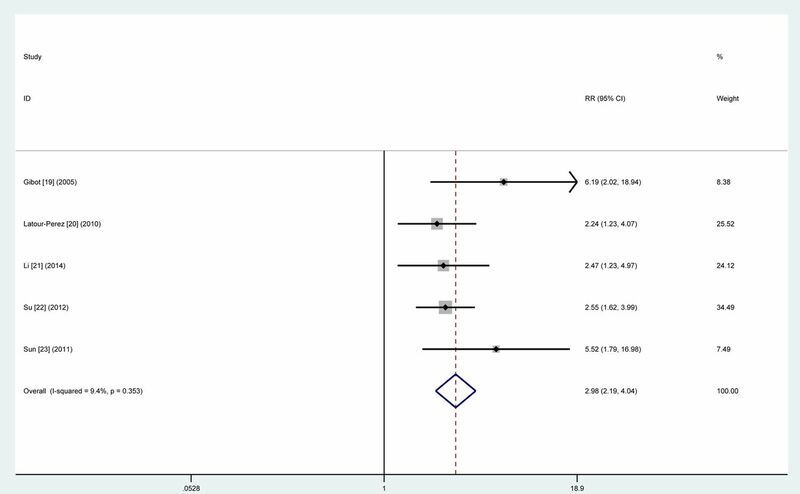 In this meta-analysis, we first determined that an elevated sTREM-1 level was associated with moderate prognosis in patients with infection. This finding suggests that sTREM-1 may be used for diagnosis, as well as prognosis of an infection. Gibot et al34 monitored change of the sTREM-1 level in 63 patients with sepsis who were divided into survivors and non-survivors within 28 days of observation. They found that the sTREM-1 level of the non-survivor group remained unchanged or gradually increased during the 28-day observation, while the level of survival group gradually decreased and severity of sepsis gradually improved. Consistently, our previous studies also showed that the dynamic change of sTREM-1 could reflect sepsis outcome, that is, a decrease in the sTREM-1 level indicated less inflammation and better prognosis.17 ,19 Li et al20 showed that elevated serum sTREM-1 provided superior prognostic accuracy to other biomarkers, including procalcitonin (PCT), N-terminal probrain natriuretic peptide, C reactive protein and interleukin-6. They further concluded that sTREM-1 level was an independent predictor of 28-day mortality. However, early prognostic value of sTREM-1 (day 1) remains controversial. Gibot et al34 found that sTREM-1 was significantly lower in the non-survival group than in the survival group at the initial stage. Kofoed et al36 demonstrated that sTREM-1 was significantly lower in non-survivors. Sun et al37 revealed that serum sTREM-1 was elevated at the early stage in patients with sepsis. In contrast, Giamarellos-Bourboulis et al41 showed that sTREM-1 was higher in the non-survival group than in the survival group at the beginning. In addition, Latour-Pérez et al35 reported that an increase in sTREM-1 during the first 3 days of evolution was associated with an excess of mortality in critically ill patients with sepsis. 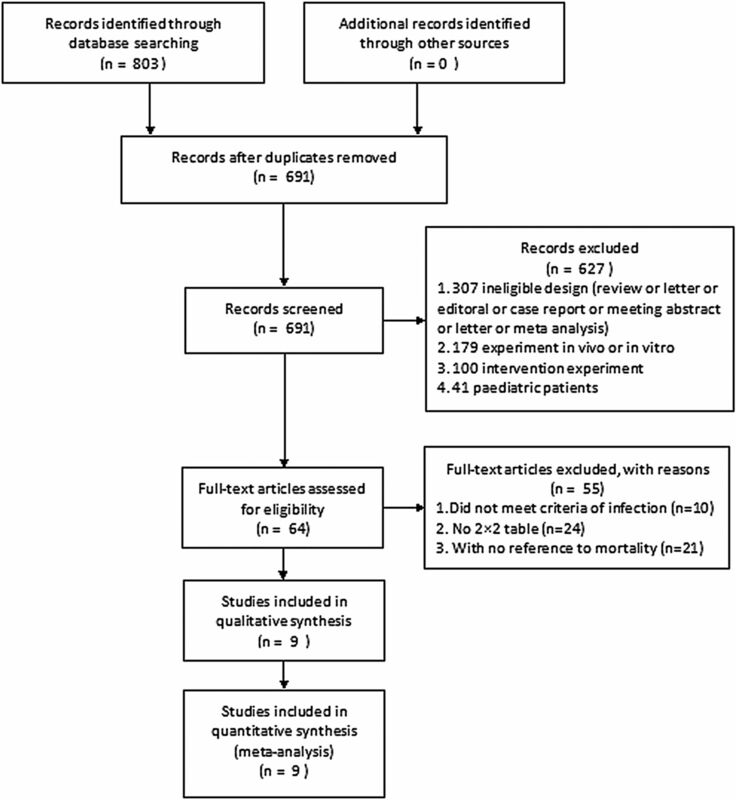 In contrast, Jeong and colleagues reported that serum sTREM-1 had no significant difference between survivors and non-survivors in the early stage of sepsis.24 In this meta-analysis, we demonstrated that an elevated sTREM-1 level was associated with a higher risk of death in infection, with pooled RR was 2.54 (95% CI 1.77 to 3.65), suggesting that increased sTREM-1 predict moderate prognosis for an infection. 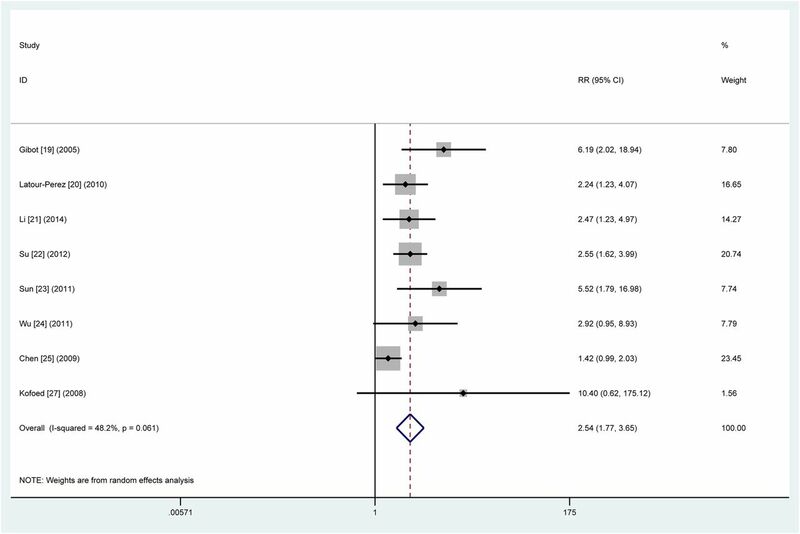 In this meta-analysis, we further found that accuracy of sTREM-1 for mortality prediction in all patients with infection was moderate with a pooled SPE of 0.66 (95% CI 0.54 to 0.75). However, when sepsis-only patients were analysed, the accuracy was slightly improved with the pooled SPE of 0.72 (95% CI 0.62 to 0.80). These findings suggested that the initial sTREM-1 might be more accurate in predicting mortality of patients with sepsis. This meta-analysis confirmed that the sTREM-1 level was higher in the non-survival group than in the survival group. sTREM-1 is cleaved from the membrane-bound type TREM-1 by proteolysis, and by this mechanism the serum sTREM-1 level is increased.6 Thus, a higher sTREM-1 level indicates more severe cell and tissue damage by proteinases released by pathogens or necrotic cells. On the other hand, sTREM-1 may have an anti-inflammatory effect.10 The mechanism of anti-inflammatory effect of sTREM-1, however, remains to be further studied. Ideally, the studies included in a meta-analysis should all be undertaken in the same way and to the same experimental protocols. However, it is unlikely, and thus study heterogeneity is a problem that can arise in a meta-analysis. In this regard, the study carried by Huang et al,40 who analysed 6-month mortality in patients with tuberculosis, seemed to be the most heterogeneous one. Indeed, the study carried out by Chen et al,39 who studied the ARDS population, accounted for the most heterogeneous contribution to sensitivity analysis. Whether ARDS and tuberculosis contribute to the study heterogeneity in the meta-analysis of sTREM-1 and infection remains to be defined by clinical studies with larger sample sizes. There were several limitations in the current analysis. First, association of sTREM-1 and mortality was not observed in every study that was included in the current analysis. Thus, we could not perform subgroup analyses. Second, we could not determine the optimised cut-off value because we could not obtain the raw data (sTREM-1 concentration in each patient) from each original article to map out the SROC curve. Third, the specimens containing sTREM-1 were both blood samples and bronchoalveolar lavage fluid.38 Fourth, in one of the selected studies, patients with sepsis were admitted to a regular floor, instead of to an ICU. This was included in this study and it might influence the conclusion. In summary, sTREM-1 had a moderate diagnostic significance in assessing mortality of infection in adult patients. Soluble TREM-1 is not a significant biomarker to predict mortality of infection, and thus a panel of biomarkers including sTREM-1 is recommended to predict prognosis of an infection.
. National inpatient hospital costs: the most expensive conditions by payer, 2011: statistical brief #160. Healthcare Cost and Utilization Project (HCUP) Statistical Briefs. Rockville, MD: Agency for Health Care Policy and Research (US), 2006–2013.
. Definitions for sepsis and organ failure and guidelines for the use of innovative therapies in sepsis. The ACCP/SCCM Consensus Conference Committee. American College of Chest Physicians/Society of Critical Care Medicine. Chest 1992;101:1644–55.
. [Expression of soluble triggering receptor expressed on myeloid cells-1 in septic patients and its relation with prognosis]. Zhongguo Wei Zhong Bing Ji Jiu Yi Xue 2011;23: 305–8. LS and DL contributed equally. Contributors LS, YL and DL conceived and designed the study. LS, DL and WC collected the data, performed the data extraction, conducted the quality assessment and analysed the data. LS and YL wrote the manuscript and also read and approved the final manuscript.